At the presidential Palace Zagulba, T.Nikolic was welcomed by the parade of the National Guard and intonation of the two countries' anthems. The two presidents opened their tete-a-tete meeting, which followed by a plenary meeting. 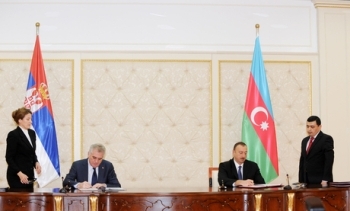 Nikolic and Aliyev signed the "Declaration on the friendly relarions and strategic partnership" which will open room for more intensive economic cooperation between the two countries. Besides the declaration, also signed "Agreement on cooperation in the field of information and comunication technologies" and "Agreement on cooperation in the Veterinary Field.